Last year for the Fourth of July I made a sun dress that had little flags all over it. I was thinking about wearing it for Memorial Day too but the dress is a little too small and I don't love it as much as I did last year. 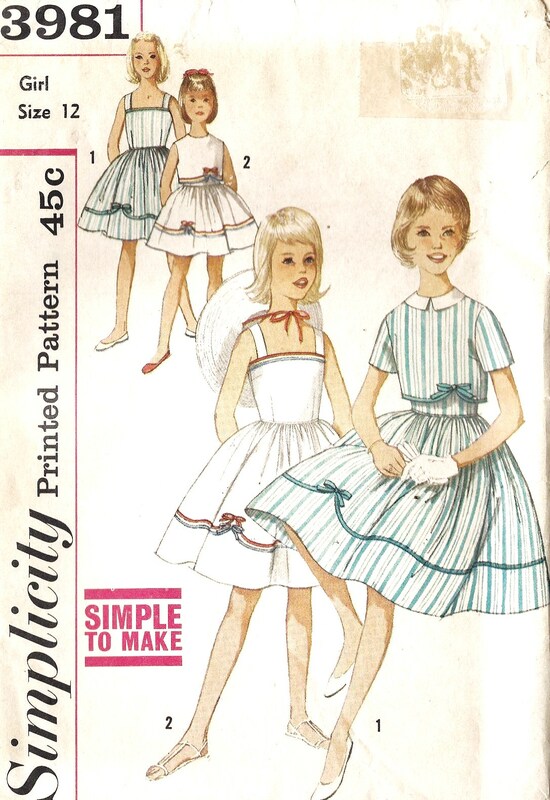 While I was on etsy I found this child's dress pattern, Simplicity 3981. The description says Simplicity Pattern No. 3981- Girls -Simple to Make- one piece dress and jacket. Dress has shoulder straps, back zipper, corded piping at waistline, and full gathered skirt. Jacket has back button closing, notch detail on front and is faced or lined. Short sleeves or sleeveless, with or without contrast collar. I love the simple white sundress with a blue ribbon and a red ribbon border. It's not too over the top. You could wear it whenever but at the same time it's great for the Fourth of July or Memorial Day. Obviously it's too small, so I figured I would keep an eye out for a simple sundress with a plain straight bodice like this one. Fortunately I happened upon a free pattern today for just the sundress I was looking for! Horrockses Fashion is a british brand established in 1946 selling bed linens. The Linens are adapted from many of their original dress designs from the 40's and 50's. They don't have any dresses yet but on their website they offer a free pattern for a sundress! It's just the type of bodice I wanted to find for this dress and who doesn't love a free pattern! I think I have enough white fabric for this dress. All I would need is the red and blue ribbons and it seems like it should be a very quick and easy sew. Of course I'll have to find the time for it still! Lately I've been trying to finish up the numerous other sewing projects laying about. Plus a lot of little sewing things like hemming some dresses and some pants and sewing on new buttons for a dress. I did spend the day thoroughly cleaning and organizing my sewing room the other day though! I love sewing when I've just got the room cleaned up and organized!